I first heard about the Masa Israel Teaching Fellowship (MITF) just before I graduated from Ohio University. Joining Hillel on campus was my first real Jewish experience; I felt a new sense of pride in myself and my heritage. That also pushed me onto the path I am now. After graduating, I reached out to the Federation and they encouraged me to participate in the program in Beit Shean, Cleveland’s sister city. I am so happy I did! It’s such a unique experience and to be able to live in Beit Shean – not many people get to do that. The city of Beit Shean is amazing and special. I really enjoyed spending time with my host family – especially during Shabbat – and living in such a tight-knit community. I grew up in a small town in New Jersey, and it truly reminded me of home. I was able to walk anywhere – the library, the coffee shop, the grocery store, and the two schools where I worked. I taught English to students in third through sixth grade. For me, through this adventure, I paid homage to my mom, who passed away two months before I left for Israel. One of the last things she told me was how proud she was of me for going to Beit Shean. I spent the majority of my time there doing the best I could to honor her. I made a connection with one of my students – a young boy, whose father had passed away a year prior. Even through my broken Hebrew and his broken English, we were able to talk about it – we were able to bond over our losses. Our situations were totally different, but I was able to sit with him and we were able to understand each other. I also had the chance to work at the library in Beit Shean. While I was there, the CEO of the Cleveland Public Library, Felton Thomas, came to Beit Shean on a Federation-supported mission. He and I collaborated on ways to educate children from Cleveland and Beit Shean – to help them grow and overcome obstacles. It was amazing to see the many similarities between the two cities. After coming back to Cleveland, Mr. Thomas and I reconnected. He asked me to join his staff. I am now doing what I love and working with an amazing organization right here in Cleveland! I can’t thank him and the Federation for this opportunity. The MASA Israel Teaching Fellowship (MITF) is a 10-month post-college volunteer program, part of I-Connect, an initiative of the Jewish Federation of Cleveland. 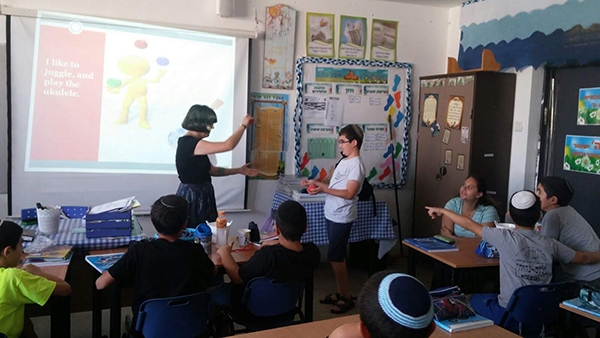 MITF was created to address the achievement gap in Israel’s public education system. The program invites talented, English-speaking college graduates to Israel as English teachers’ aides. It’s a challenging, rewarding experience for the teaching fellows, and a vital investment in Israel’s future. Get more information about becoming a Masa Israel Teaching Fellow.